2017 marks the 90th birthday of Cecil and Larter. Established in 1927, the company has been a staple of Bury St Edmunds town ever since. What started out as a small roadside garage has now grown into a dealership representing both the Volvo and SEAT brands. 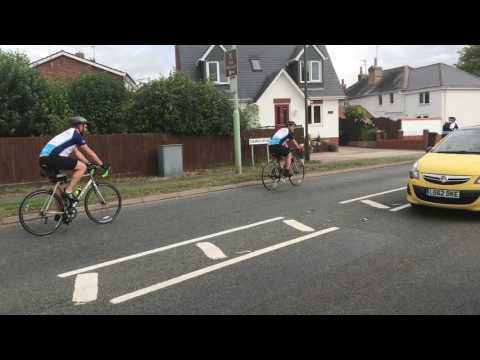 To celebrate this landmark birthday, the staff chose to put together a team of 3 riders who on the 20th July cycled 90 miles from Bury St Edmunds to Felixstowe, and back. This challenging bike ride is not only to raise money for, but to also bring awareness to The Sick Children’s Trust. The day started at 8:30am with the riders setting off on their journey to the very edge of Felixstowe, where the half way point had been set. The team made good ground and managed to make it there within 4 hours, right in time for lunch. The weather however, was not in their favour through the second part of the day. The sudden down poor of rain meant the riders were delayed by half an hour, but this did not slow their determination. After a gruelling uphill battle into the wind, the team managed to make it the full 90 miles back to Cecil & Larter, scrapping in before 6pm, just in time for pizza and ice cream. After 9 hours of cycling the trio were truly ready for a rest.